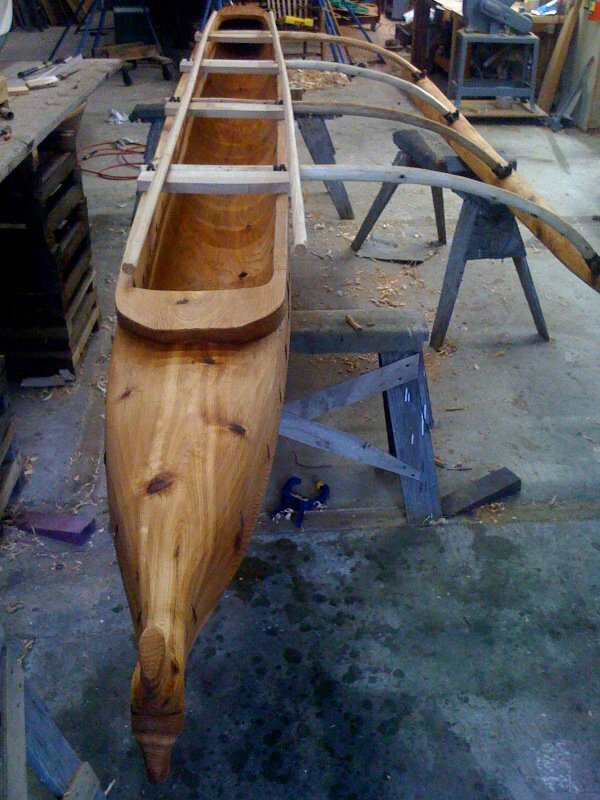 Rob Stevens has posted a new list of bark canoe resources on the website of the Wooden Canoe Heritage Association. It includes lists of canoe builders, books, videos/other media, and relevant organizations and museums, and it seems pretty comprehensive. Rob told me earlier today that a couple of the links are broken and he's working to fix them, so if you follow a link in the next hour or so and it doesn't work, try again in a few days. The canoe shown here was built at Penobscot Marine Museum last summer by a team of apprentices working Steve Cayard, one of the finest practioners of the art. It's for sale by the museum, proceeds going to repeat the program and help perpetuate this rare skill among Native American people. 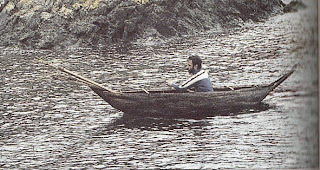 This unusual little craft -- and I emphasize the "little" -- may be among the oldest plank-built boats still in recent use. According to G.R.G. Worcester in The Junks & Sampans of the Yangtze (1971), a Chinese history written in 90 B.C. attributes its invention to the Emperor Yü, (2205 B.C.). So it's clearly more than 2,100 years old, and possibly more than 4,200 years old if the ancient text is to be believed. 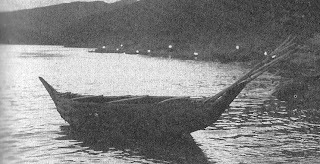 ni-mo-ch'uan from The Junks & Sampans of the Yangtze, G.R.G. Worcester. Click to enlarge. ﻿ The boat is known as the ni-mo-ch'uan, literally "mud-touching boat." It is used on mud flats when they are exposed at low water to collect a highly prized edible snail. 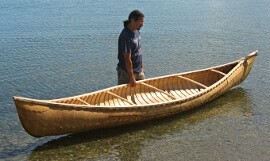 The ni-mo-ch'uan is a tiny form of sampan, being built of three 1/2-inch planks and subdivided by bulkheads. The one shown is 6' LOA and a mere 9-1/2" beam, with sides only 3-1/2" high. At just 1-1/3 cubic feet, this may be the smallest hull, by volume, of any known boat. The transom features a semicircular cutout that is key to the method of propulsion. 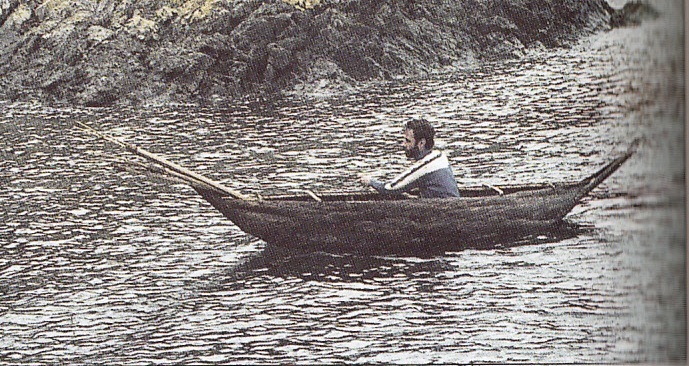 The shellfisherman kneels in the stern, with one knee on the bottom board and his shin resting in the cutout. The other leg he extends over the side of the boat, and uses it to propel the boat by pushing with his foot against the mud. He supports his upper body by holding onto the crossbar, which is raised about 18" above the boat's bottom. Worcester days that "progress is achieved quite rapidly" over the mud in this manner. Captured snails are kept in a basket in the bow. The hull is rockered at the bow, to assist the boat in moving over the mud, and flat astern, to maximize buoyancy beneath the operator. Worcester notes the limber beneath the transom notch, to drain water, but it's unclear how this would not permit more water to enter than it allows to drain out. Perhaps it was stopped with a wood plug or a twist of grass and mud when the boat was afloat. 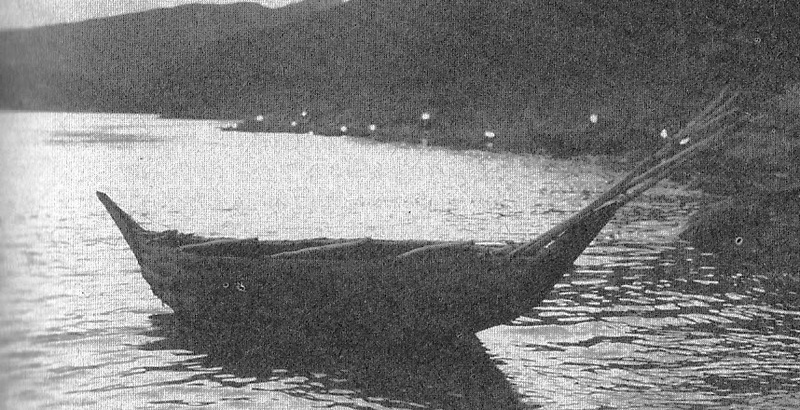 When observed by Worcester, the boat was "indigenous to the Shanghai area," and similar craft were "used in most of the shallow lakes and in the Tungting Lake, being diverted from their ordinary purpose and used for duck shooting." "It is recorded that a town on Hangchow Bay was once attacked by pirates whose boats had grounded on the mud flats by the falling tide. A certain enterprising and warlike villager called together all the owners of the mud-touching boats and at night proceeded out to the stranded pirates, who, being taken completely by surprise, were all either killed or captured." This photo was posted today on WoodenBoat's Facebook page. The only information given is that it is being built by someone named Brad Rice. Wish I knew more. Nice work, Brad! Several months ago, I noted a museum exhibit about Zheng He, the Chinese diplomat and mariner who led a number of expeditions throughout the Indian Ocean in the 15th century. (Wikipedia article here.) At the time, I wasn't aware that Chinese archaeologists were in the process of excavating a wreck that has been identified as one of his ships in the Lamu Islands, off the coast of Kenya. Interestingly, genetic analysis has shown the presence of Chinese ancestors in some of the local populace. Article here. 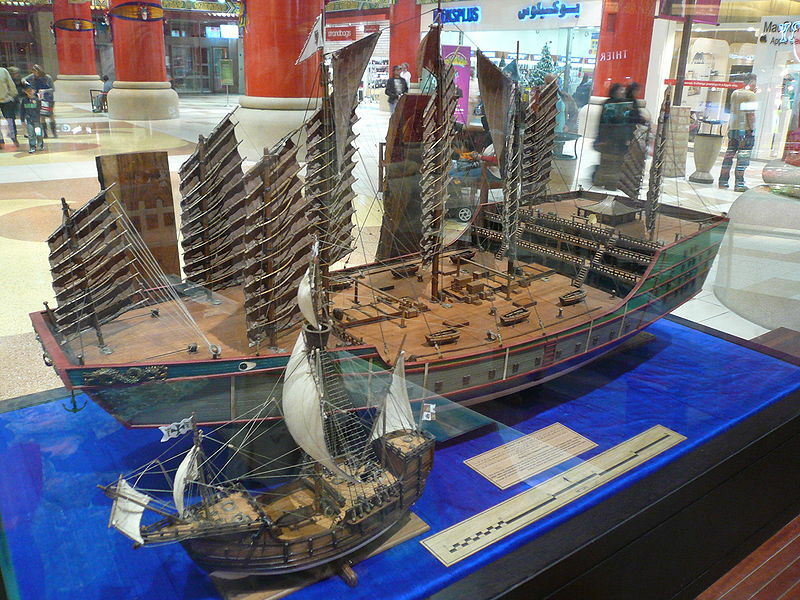 Zheng He's expeditions were enormous, starting with the ships themselves. The treasure ships, the largest of the fleets, were over 400 feet LOA and 170 feet beam, and had a nine-masted rig. These appear to have been the largest wooden ships ever built by a long shot, and they put the lie to the tale that the most masts ever mounted on a ship was seven (on a Maine-built schooner). His fleets contained a small number of treasure ships and literally hundreds of smaller vessels carrying tens of thousands of sailors and warriors, water, horses, and all manner of supplies. 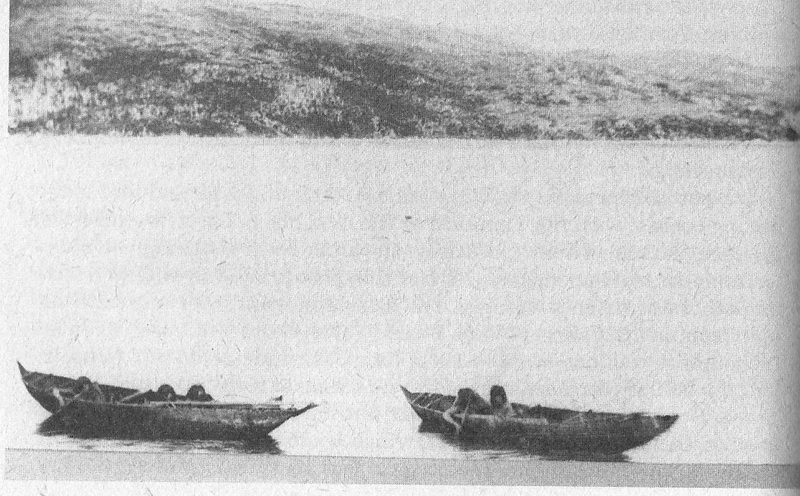 ﻿﻿﻿﻿Bark canoes were the central item of the physical culture of the Yamana people of Tierra del Fuego. These nomadic hunters – also known as Yaghans – occupied the islands south of the Beagle Channel and a narrow strip of land on its northern shore, making them the southernmost permanent population in the world when they were first described by early European explorers. 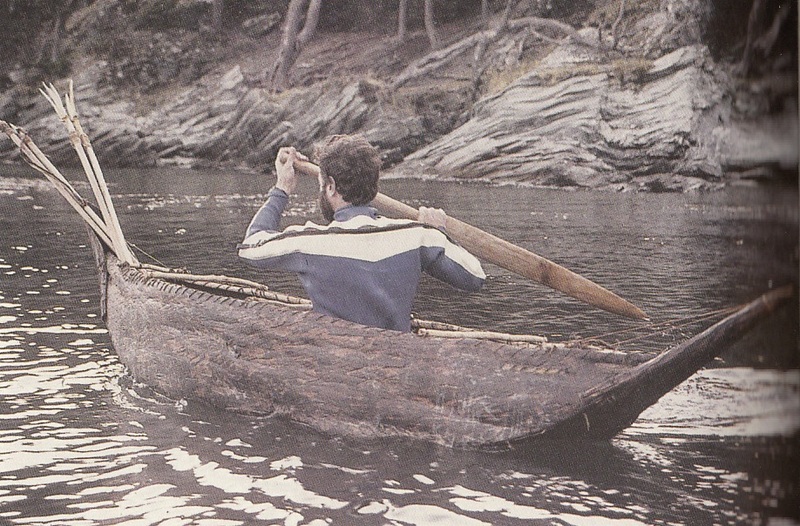 As they subsisted mainly on a diet of sea lion meat and shellfish, the canoe was essential to their survival. Unfortunately, though, and in spite of a number of descriptions of the Yamanas by European observers, not much is known for certain about their canoes. This is not because those canoes were not observed, described, or even illustrated. But the extant descriptions and drawings disagree with one another so frequently and in so many fundamentals that it is difficult to sort the facts. 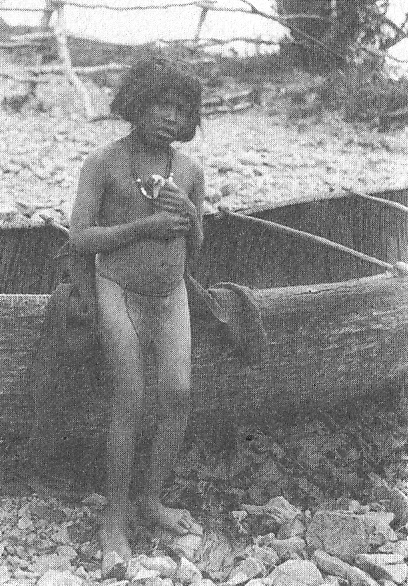 Even photographs taken during an exploring expedition in the 1880s, when the Yamana culture was tottering toward extinction and the boats may or may not have remained unaltered from their pre-contact forms, are often too dark and blurry to clarify some of the issues. 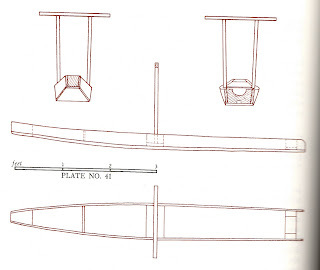 Some illustrations show a bow that divides into two prows, or possibly even a twin-hulled form, while others show a simpler shape coming to single points at each end. 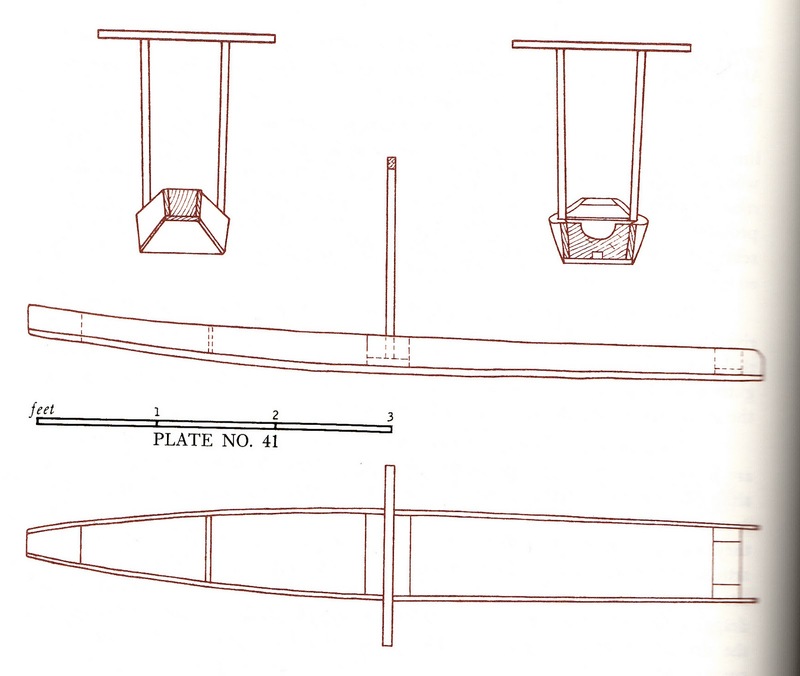 Above: one European interpretation of the Yamana canoe had a horizontally bifurcated prow, or possibly twin hulls. Below: another interpretation had a slightly more conventional single-prow, monohull form. Were there two very different types, or are the differences the result of some very poor observations? Likewise, some of the boats were reportedly 25 or even 30 feet long, capable of carrying five or six people, while other reports limit the length and crews to maybe half those figures. 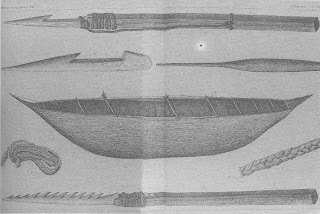 No observer seems to have mentioned two different types of canoes, but it seems unlikely that descriptions and illustrations could vary so greatly for a single type. Above and below: Yamana canoes photographed by a French expedition, 1883. Only as the culture reached its end did any samples of the canoes come into European hands for close examination, and these were all of the smaller, single-pointed variety, about which, naturally, more information exists. Even so, I have not seen any lines drawings, offsets or anything of the sort, and much about the true shape and construction is somewhat speculative. Compared to the North American bark canoe, the Yamana canoe was a rather crude affair – though more sophisticated than bark canoes found in Australia and Africa. The hull was formed of three main pieces: a bottom section, curved up at the ends, and two side panels, cut in profile to match the rockered shape of the bottom. On longer examples, triangular sections of bark were added to the fore and aft ends of the bottom to lengthen it. Where the sides met the bottom, it is possible that the edges were beveled to fit flush against one another. Amidships, the half-breadths were somewhat like a Banks dory, with flat floors and flared sides, although the bottom was wider than on a dory relative to the maximum beam, and the sides somewhat more vertical, and sporting some tumblehome due to natural warpage of the bark. Toward the ends, though, the topsides tumble home to meet the fore and aft "transoms," which narrow to a point. The waterlines were somewhat like a sampan, though narrower. Light poles lashed to the upper edges of the side panels served as gunwales, and a small number of widely-spaced frames and thwarts stiffened the sides and bottom. All of these structural members were left round in section. Short, narrow lengths of bark were creased in thirds and laid between the frames to serve as ceiling, protecting the inner surfaces of the hull bark from damage. Loose bark floorboards were laid atop the ceiling for further protection, and probably to elevate cargo and passengers above the bilge water that would inevitably accumulate. This photo by the 1883 French expedition shows details of the framework, lashings, and bark panels. The boy looks obviously embarrassed, probably because the missionaries made him overdress for the occasion. 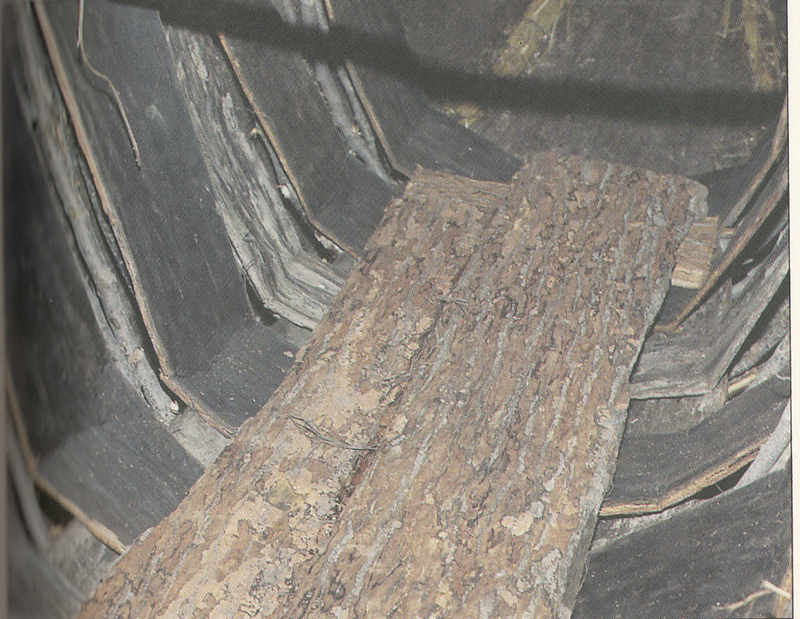 Interior of the Vairo replica shows bark floorboards, bark ceiling, and frames between sections of ceiling. Lashings between frames and hull and between bottom and side hull panels were made with strips of sea lion skin or, occasionally, from fibers from the inside surface of stripped bark. A mixture of vegetable and earthen matter was used for caulking between the side and bottom panels. Various reports name moss, hay, seaweed, and wild celery as the fiber, and clay or mud as the binder. Fiber caulking and lashings between side and bottom panels in the Vairo replica. Several inches of sand and/or mud or clay were laid in the bottom. This served both as ballast, and as a fireproof surface upon which a small fire was typically kept burning. By keeping a fire burning in the boat, the nomadic Yamana were saved the trouble of kindling a fire anew when they arrived at their next temporary home. It also may have served to keep the occupants warm, and perhaps they cooked while under way. It was the presence of dozens of canoes carrying smoky fires when under way that may have led to the name Tierra del Fuego (land of fire). In The Yamana Canoe: The Marine Tradition of the Aborigines of Tierra del Fuego , Carlos Pedro Vairo is undecided whether the canoes were built frame-first or shell-first. But his team's experience attempting to recreate a Yamana canoe of this sort argues strongly against the notion of frame-first building. Even proceeding shell-first and thus allowing the bark to bend more or less naturally, they found it nearly impossible to avoid cracking the bark into uselessly small pieces. 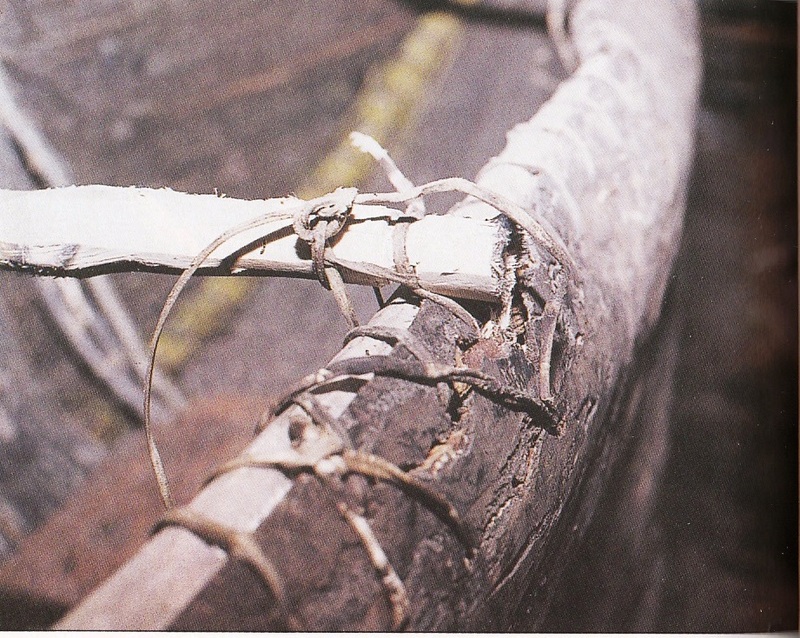 This being the case, attempts to bend the bark to the shape of a pre-made framework would certainly have failed. Perhaps more to the point, the frame clearly appears to be a stiffening structure, as in a lapstrake hull, and not a structural skeleton as in a carvel one. There is, I'm sure, much value in The Yamana Canoe, but it is unfortunate that its English translation is just plain awful. Much of it is difficult or impossible to make sense of, and it's possible that what sense can be made of some passages is just wrong. Some elements of Vairo's research project itself also seem dubious. 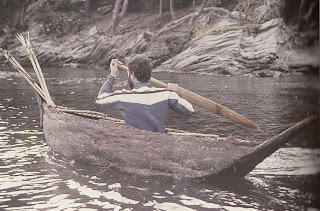 The extreme difficulties his team experienced with the bark of evergreen beeches that they used for the canoe's construction seems to indicate that something was amiss with the project nearly from the start. Even after weeks of attempts during which apparently dozens of trees were stripped of their bark, the team was unable to obtain pieces large enough for a canoe more than 10 feet long -- probably at or below the minimum length of the canoes actually built by the Yamana. They experienced further difficulties transporting bark sections, curing, bending, and sewing them, and with the boat finally, if tenuously assembled, they found that it suffered cracks during every single usage, necessitating major repairs. The Vairo replica was at the extreme small end of the scale for authentic Yamana canoes. A few replicas of Yamana hunting tools extend above the bow. Although Vairo reported good paddling performance, his text makes one skeptical of his canoeing experience, his understanding of canoe performance, and of his ability to accurately comment on the matter. The photo below shows the poor quality of lashing at a thwart and numerous cracks in the bark hull side panel. Although it's impossible to know just how difficult the evergreen beech bark was to work, this photo makes one seriously question the boatbuilding aptitude of Vairo's team and their choice of materials. Gunwale and thwart lashing on the Vairo replica. Note the badly cracked bark. Early European observers described the process of stripping the bark from the tree. Hanging from an upper branch by a rope, a man would use an unhafted stone blade to make a long vertical incision and two circumferential cuts at its top and bottom. After prying the edges of the bark free of the trunk with a pry bar made of wood or whalebone, he would then force himself under the bark and use his whole body to push the bark entirely away from the trunk. One can excuse Vairo for not attempting to duplicate this unpleasant task, but it appears that he may have selected the wrong species of tree, attempted to harvest it during the wrong season, or was unaware of some method of treating the bark either while still on the tree or after its removal, to make it easier to work and less prone to breakage. 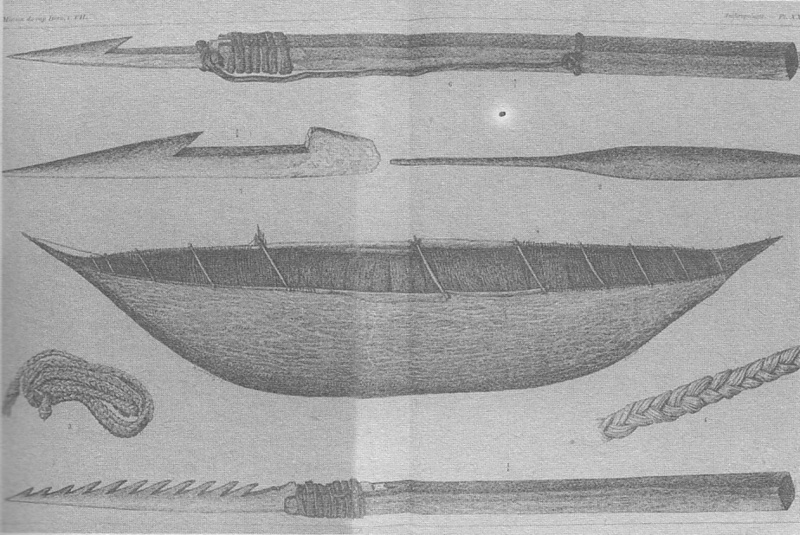 The Yamana maintained a distinctive division of canoe-related labor between the sexes. Men stripped the bark and did most of the construction work, although women may have done the sewing or lashing. Once the canoe was complete, women were solely responsible for its maintenance. Women were also the primary paddlers, calling upon a man for assistance only when a paddling task demanded it. All paddling appears to have been done to starboard, with the canoe heeled far over to that side. There is no evidence for the use of sails prior to European contact, although simple square sails were adopted soon after contact was made. 1883 French photo showing the heeled-to-starboard paddling position. Women gathered shellfish from the canoes, often diving into the frigid waters to collect them by hand. Spears with multiple prongs were used to collect crabs and some other resources. With the woman paddling, men hunted sea lions with harpoons (and possibly with clubs when on land). Seeing daily use, and being constructed of bark that – even if Vairo had it wrong – was clearly not as durable or flexible as the paper birch bark used by North American Indians, Yamana canoes were short-lived, typically lasting only three to six months, and a year at the most. Steps were taken, however to maximize their life where possible. Rather than landing on hard rocky shores, it was common to tie the canoe up to beds of kelp growing nearby and then swim ashore. Kelp was also torn up and placed on the rocky shore as padding when the canoe did need to be landed. And in established portage locations where canoes were repeatedly dragged long distances, semi-permanent skidways of poles were constructed, similar to the canoe ladders used by Hawaiians. But given the canoe's short lifespan, the culture placed a high value on the ability to build them. 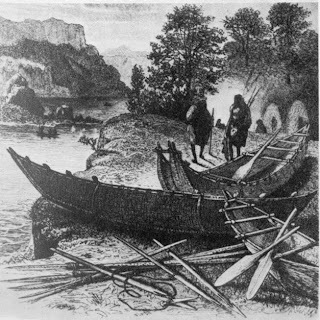 A man who could not build or did not own a canoe was considered to be incomplete – not fully human in the sense that the culture understood itself to be. 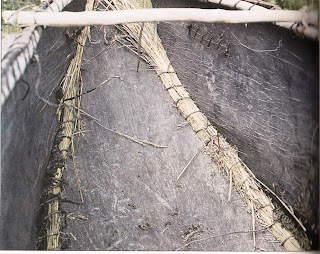 The climate of Tierra del Fuego has ensured that no pre-contact canoe artifacts remain for study, so it is unknown how long the bark canoe in the form described may have been in use. Vairo cites indirect but convincing evidence for the probable existence of a maritime culture in the region going back about 6,000 years, but it is impossible to know what kinds of boats might have preceded the Yamana canoe or if, conceivably, the Yamana design goes back to the earliest days of seafaring in the region.